Magical Parent – Magical Child began with a simple insight; The Future Is Now. If I am aggressive or kind today chances are I will be the same way tomorrow and my children will be too. If I want to bring about real change, a new pattern or possibility, a baby step forward in evolution it must take place now, this moment. By changing how I think, feel and act - now - I create a different next moment. If I don’t change now - I will be tomorrow what I am today. Gandhi said; ‘be the change we want to see in others’. This insight brings that change, which is the future, into the present. Right now is where all the action is. Now is the only chance we’ve got. Joseph Chilton Pearce added depth to this basic insight when he described the ‘model imperative’ in his best selling book, The Magical Child. Each of us represents vast capacities, more and greater than ever imagined. The awakening and development of each capacity requires a model-environment to serve as a catalyst for that potential’s opening and development. No model – no development. That is the ‘model imperative’. What does this mean to you and me and most importantly our children - the future of humanity? Millions of years of genetic memory and potential are packed into every cell and trillions of these cells combine to make up each unique human being. In the past genetic encoding was viewed as a rather fixed, mechanical blueprint. Recent discoveries tell us that genetic expression is far less fixed than ever imagined. Fixed patterns do exist however, the entire system is constantly adapting. That means changing, transforming in response and in relationship to environmental signals. Genes are much more verbs, moving, changing, than nouns. The entire human experience is one of constant change - surfing the ever-changing waves of the universe. At the same time nature is extremely conservative. Once a pattern has been established it quickly becomes a habit. It takes energy-attention to forge a new pattern, something we call growth or learning. To conserve energy nature fixes new patterns into habits which frees attention to reach into the unknown and meet the next new discovery. The entire spectrum of human development depends on attention and how we use it. Is our attention recycled, invested mechanically in preexisting patterns or is some attention free to observe, inquire, to wonder, explore and test new possibilities – right now? The younger the child the fewer habits there are demanding energy, meaning most of his or her attention is invested in play, and play is the act of discovery, learning and growth. As we grow-up new patterns build-up in the system. The maintenance of these habits, which are prejudgments, reflexive prejudices, increases which reduces the available energy we have to invest in growth and development. As the saying goes: it becomes increasingly difficult to teach an old dog new tricks. We become set in our ways. Habits take over. Real development slows and often stops all together. Livelong learning demands that we keep our energy-attention balanced between maintenance and discovery, that we walk, as the Buddhist say, the middle way, not too fixed in our ways or too wild, but rather maintain a balance, the best of both. If the amount of energy-attention we bring to the moment remains constant as more and more patterns build-up it is easy to how the system gets bogged down in maintenance at the expense of continuing growth and development. The weight of conditioning consumes all of our energy. The key is to increase the quantity and quality of energy-attention we bring to the moment. The hidden agenda of nearly all so called spiritual practices involves this gathering and expanding of attention. Only in this way will we have enough energy-attention to raise our awareness out of the maintenance-reflex system and continue to playfully surf the waves of the change. If not, will get stuck in our conditioning. Physically we can safely say the adaptive dance begins when the female egg selects and opens herself to one-in-a-million wiggly sperms banging at her door. Think of the mother’s body awash in hormones and the ebb and flow of hormones acting like a timed symphony surrounding this now fertile egg. Each day the notes of the hormone-symphony trigger new adaptive mutations causing the next level of complexity to unfold in the emerging human being. Millions of years of genetic memory imply an expectation and need for the precise note of this symphony, each a triggering catalyst, to ring at just the right moment along the developmental sequence. What if the expected environmental signal, the model-imperative of the moment, rings too soon or not at all? The symphony is thrown off. Notes are missing, played too soon or too late. The result may be a clef pallet, downs syndrome or other abnormality. Now apply the same implied expectation and critical need for a model-imperative on a grand scale to each age and stage of development. Recall how the mother’s body was the model-environment for the developing fetus. What takes place in and around her day-by-day; the food she eats, the toxins she is exposed to, the feelings of anxiety or joy she experiences – right now - as she relates to her model-environment, all that resonates as a symphony and directly influences her child’s development. The same is true for the two-year-old, the child of the dream at age five, the born again teen at age thirteen. Kids are NOT the Problem. You and I, every adult and the adult culture are the model-imperative. We are the sand or rich soil nature plants her seeds in. The way you interpret and respond to the world – now – not as an idea but as an actual fact – has a profound and direct impact on your child’s development and therefore on the future of humanity. What could possibly be more impotent? The latest propaganda on Fox News? The paid opinions and hate-gossip on Talk Radio? The stock market? Universal standards and high stakes testing? Who wins the next soccer match? Nothing you do or even dream of doing will compare in importance to the way YOU, as the model-imperative influence the next step forward in human evolution or its retardation this moment. Try as you might you can’t escape the responsibility. None of us can. 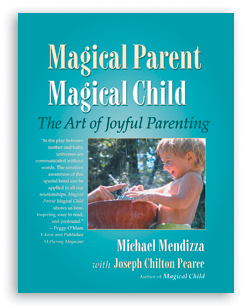 Magical Parent – Magical Child begins here – now - as each of us faces this challenge. The book offers no formula. There are no rules to follow. The theme that unites the entire body is what Joe and I call The Intelligence of Play. Thought and knowledge represent the past, useful indeed but they are conditioned. Collectively this conditioning expresses as culture, tradition, all sorts of beliefs and behaviors, religious, political ideology, dogma, the things that cause most wars and conflicts in human relationships. In his most recent book, The Death of Religion and Rebirth of Spirit, Joseph Chilton Pearce offers a compelling argument that the weight of conditioning, as culture, represents a near demonic force that prevents true human development from unfolding which takes place spontaneously in the state children call play. Ashley Montague echoed the same insight in two of his more than fifty books, The Dehumanization of Man and Growing Young. The Dehumanization of Man occurs when cultural conditioning becomes dogma, when belonging to the group demands blind conformity, when behavior becomes mechanical, reflexive. David Bohm, one of the most renowned physicists of the 20th century, observed, ‘there is no intelligence in a reflex’. Dogmatic, reflexive, mechanical behavior in adults lacks true adaptive intelligence and for that reason, individually and collectively is very dangerous, especially as the model-imperative for the next generation. The opposite, Growing Young, takes place when the characteristics Ashley called ‘the genius of childhood’, or the intelligence of play; open-mindedness, flexibility, willingness to try new things, humor, trust, complete attention, affection and other childlike qualities are carried forward into adulthood and throughout life. The challenge each of us face, especially as parents and educators, is to balance conditioning and is content with true intelligence which is not content, rather a state of being brimming with mindful attention, curiosity, wonder, the genius of childhood that prevents content from becoming reflexive, mechanical dogma. This, of course, is increasingly rare and difficult in our fast changing, over stimulated world. Joe and I hope this little volume helps you rediscover the intelligence of play, to embody the genius of childhood every moment of your life, especially when serving evolution as the model-imperative for her next leap forward. The key to meeting this challenge, we believe, is a concept we introduce and expand called ‘state specific learning and performance.’ Educator and sport psychologist Tim Gallwey described state specific learning and performance in his series of books beginning with The Inner Game of Tennis. Using Tim’s sport-performance model, each moment there are two games going on; one - the outer game or challenge, the ball flying over the net and two - the inner game, how we the parent-player are relating to and feeling this moment as we play the outer game which, in our case, is called being a parent. 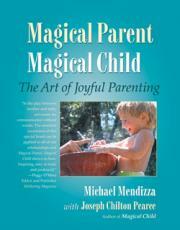 The key concept throughout Magical Parent – Magical Child is really very simple. The state we are in as we meet the ever-changing challenges collectively called parenting shapes how we interpret, perform and what we - and our children - learn form the experience. Child and human development is widely dynamic, moving, always in transition. No formula can predict and control the challenges each of us face mentoring each unique child. Kids are like pitchers in baseball. They challenge and help us develop new capacities and skills by throwing unexpected curve balls many times and in different ways each day. Our challenge, as a parent, is to be in the best possible state so we can really play the parenting game and meet each unexpected challenge in the best way possible. As you will soon discover the state athletes call The Zone, researchers call Flow and every child calls Play is the optimum state to meet any challenge at any age or stage of development. It is helpful to remember along the way that becoming a parent is a developmental stage for adults as difficult and challenging as leaning how to walk and talk is for a two year old. Books can help but the best teacher, the only teacher really is experience. That’s why performance specialists, athletes, musicians and dancers practice. The only way to master any new skill is practice, hopefully by the side of experienced mentors. Becoming a Magical Parent is not really different from becoming a world class athlete or singer. All we need is a safe space to practice and experienced mentors (the model-imperative). Magical Parenting means really playing the game called being a parent. When we are really playing, that is, in the state of authentic play failure isn’t possible. Unlike high stakes testing or the World Series, given a safe place to practice and experienced mentors, meeting every challenge becomes an opportunity to expand and develop our capacity to meet every challenge. There are no right or wrong answers. The score of the day is irrelevant. Rather, the goal is continuing expansion of capacity and potential which takes placed naturally in the optimum state called play. After interviewing over thirty professional PGA and LPGA tour players the two questions that mattered the most from the most important people in a developing masters life were; what did you learn from the experience and did you have a good time? Both questions relate to the optimum state called play; learning and development being the true purpose of play and the joy this continuing development represents being the feeling the play-state evokes. The key is to just keep playing. Joe put it this way in The Magical Child: Play on the surface and learning takes place automatically beneath our level of awareness. Ask yourself these two questions as you become a Magical Parent. What are you learning and are you having a good time? Do this and the score will take care of itself.